Dollar stores are one of modern America's enigmas. I don't know why they haven't been a standard presence in most of the history of free market capitalism, but they've certainly fed into a need almost anywhere. Their sudden boom over the past decade or two is evidence of that. Anyway, I do have a cautionary tale. Never go there on an empty stomach and a weak sense of willpower. It's not a secret that the food you find at dollar stores fall into one of two categories: they are either 1) mere minutes away from forming mold, or 2) they are hopelessly generic. You won't find many Hershey Bars at the dollar store, but you'll find plenty of Herschman's Chocolate-Style Rectangle-Shaped Snack Foods. Still, they'll do in a pinch. I had the misfortune of having to run to get dog food hurriedly last week. "Misfortune" in quotes because the only reason I had to do this is because I was lazy and didn't get any until we were all out. Of course, the place I usually get it from is drenched in traffic roughly 100% of the time, so running there and back is always a bit dicey. So after I get the dog food (and resisting buying every single dog toy in the place) I realize that I am hungry. Not just hungry, but stomach-growlingly hungry. So I decided to run into the dollar store to grab something quick and easy to pad down my hunger. I knew I wasn't getting top-quality, here, but I figured I could just grab something small. I didn't just want candy, I was hungry for something crunchy--nuts or chips or something. But I was shopping while hungry, which is always a bad idea, and I ended up getting quite a few things. Spicy nuts are good, right? And peanut butter is healthy, correct? And as dessert, how can you go wrong with fudge AND chocolate? In retrospect, I have instituted a new rule, and that is never trust anything with a logo that has a sombrero unless you see an actual Mexican prepare you some Mexican food. 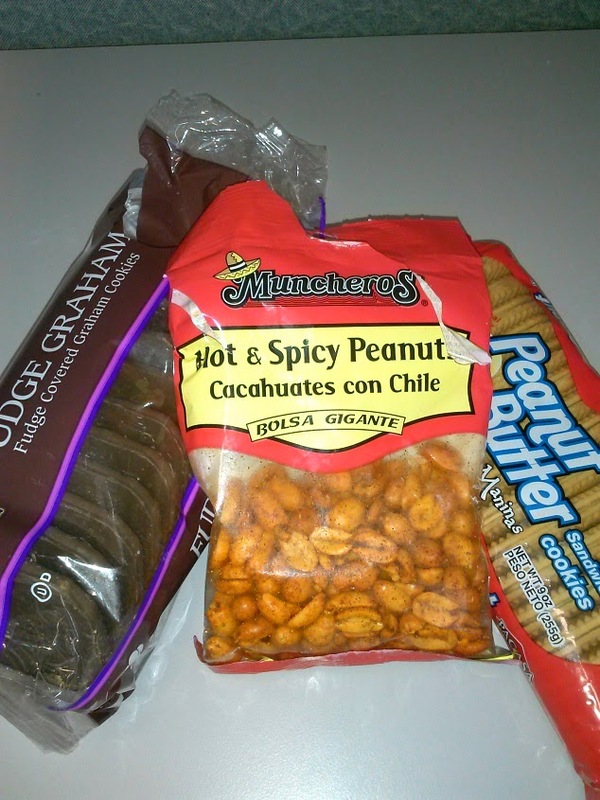 (Are spicy peanuts even supposed to be a Mexican thing?) Not only were these peanuts not very good, they actively made me simultaneously hungrier and lose my appetite. I'm not even sure how that is possible, but somehow this little packet of nightmare kernels did it. At this point, I was suspect of the fudge grahams, and rightfully so. Oddly, it wasn't that bad--which the chocolate tasted nothing like chocolate and everything like brown-painted wax, the graham crackers were at least decent. It's hard to screw up graham cracker, although I'm sure someone in the dollar store biz has tried. Anyway, learn from me this simple life lesson: don't go to a dollar store hungry and expect any sort of satisfaction. And if you do, stick with the name brand Mike and Ike's. Those things never go stale.